When it comes to cooking pasta, there’s a lot that can go wrong. Sure, it’s relatively easy to prepare, but sometimes the easiest cooking techniques are the ones that have the highest opportunity for error. So we put together 12 simple cooking tips for making pasta — from how much salt to add to the water to whether or not you actually need to rinse it— to make sure you never cook up a sad batch of pasta again. If you’re planning to toss your pasta in a heavy sauce like bolognese or ragù, stick to tubular pasta shapes like penne or perciatelli that trap the sauce so you get the perfect ratio of sauce to pasta in every bite. For more delicate sauces, like pesto or garlic oil, thin, long pastas like spaghetti are better suited. Consider the amount of sauce you want in every bite of pasta. If you want a ton of sauce, go with shapes with lots of nooks and crannies to trap the sauce. Learn more: Check out a helpful guide for perfectly matching pasta with sauce. 2. And use a large pot so the pasta doesn’t become too starchy. Aim to cook your pasta in a large pot and use at least four quarts of water for every pound of pasta you use. This is because pasta releases a ton of starch while cooking, so it can become slimy if there is not enough water. If you cooked pasta in a small pot of water, it would become thick and coat the pasta in a sticky coating that might make it stick together. A rolling boil refers to water that’s rapidly boiling with a ton of bubbles — and this is where you want your water to be before adding your pasta. Water at this temperature helps “set” the outside of the pasta and prevent it from sticking, while just-boiling water can cause your pasta to turn out mushy, sticky, and stuck together. Pro tip: To make your water boil faster, always start heating it with a lid on. 4. And make sure you generously season it with salt. The general rule of thumb is to season every gallon of water you use with one tablespoon of salt. While this may seem like a lot, most of it will go right down the drain and it’s the only time you can season the pasta itself — so don’t be skimpy! Pro tip: Use kosher salt, not table or flake salt, when seasoning your pasta water. Table salt can make your water too salty, while flake salt might not make it salty enough. 5. Disregard the cooking time on the packaging, and instead taste it as you go to determine when it’s done. Packaging instructions are a great guideline for cooking pasta, but it’s not foolproof. Sometimes it takes longer to cook, but more often than not it takes less time than stated. Start checking your pasta three minutes before the package tells you too. Just take a piece out, let it cool off for a second, and taste it. You want it to be al dente (meaning it’s tender but still has a bite), not completely soft. Also keep in mind that if you add your pasta to a hot sauce, it will continue cooking — in which case you should drain it a tad before it’s al dente. 6. Constantly stir your pasta during the first minute of cooking. A large amount of the pasta’s starches starts to release during the first minute of boiling — meaning it’s the time when the pasta is most prone to sticking together. To prevent a sticky mess, constantly stir your pasta for the first minute, and after that you can ease up and stir it every 30 seconds or so. Despite what you’ve heard, adding oil to your pasta water won’t prevent it from sticking together. The only way to make sure your pasta doesn’t clump together is to stir it and keep it at a rolling boil — and adding oil will do nothing but pool at the top of the water. 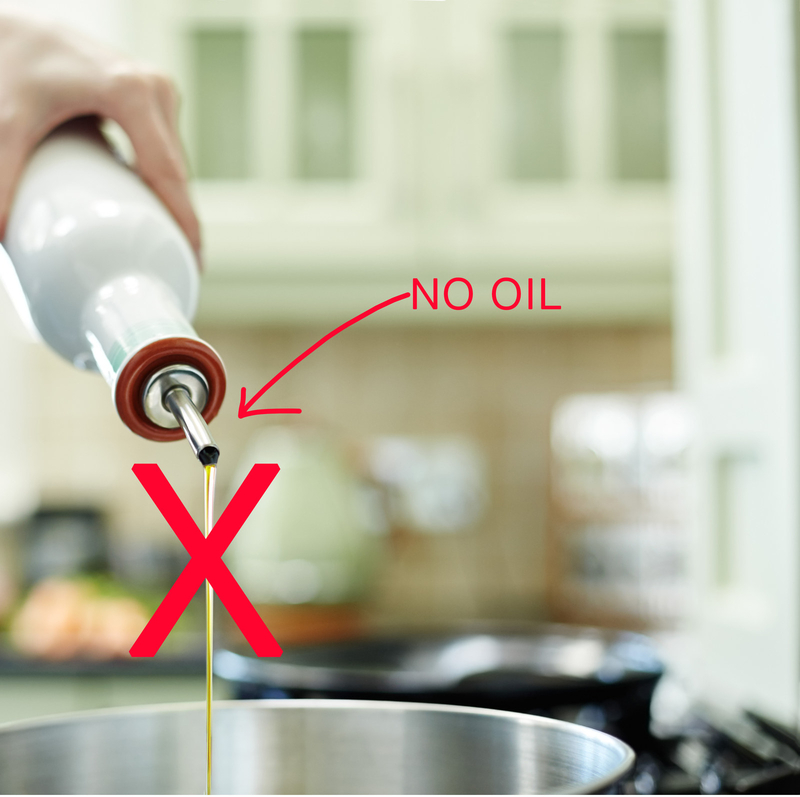 Additionally, adding oil to your water might actually prevent your sauce from sticking to the pasta properly. When straining, the oil coats the noodles, making them too slippery to cling to sauce — so go ahead and ditch the oil. 8. 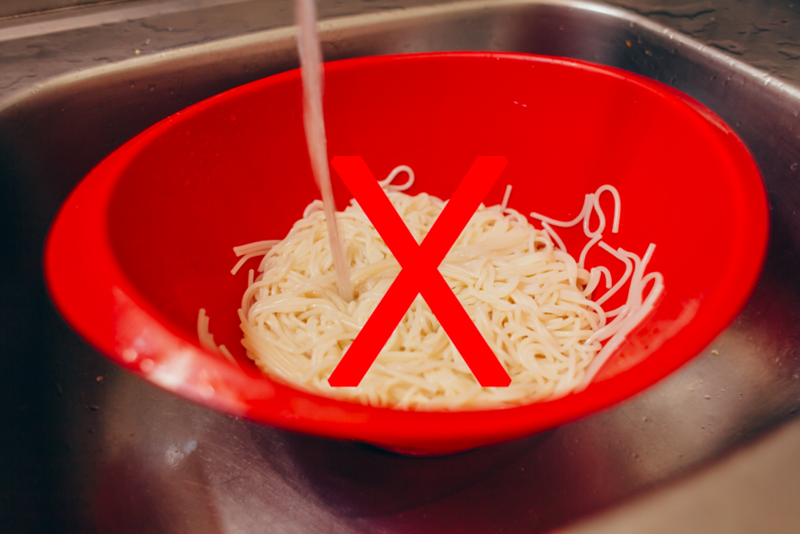 And unless you’re making a cold pasta salad or stir-fry, never rinse your pasta after cooking it. Remember that starch we talked about? It comes in handy when you toss your pasta with sauce, helping your sauce stick to the pasta. If you rinse your pasta in water, it removes all of the starch and results in sauce that slides right off your noodles instead of perfectly melding with them. The only time rinsing comes in handy is if you’re making a stir-fry or pasta salad. This is because you don’t want stir-fry noodles to stick to your pan, and you certainly don’t want to add hot noodles to a cold salad — so rinsing does have its place, just not for most pasta recipes. 9. If you plan to boil your pasta in advance, make sure to toss it in olive oil once it’s cooked to prevent it from sticking together. If you’re not using your pasta right away, toss it in a tablespoon of olive oil to prevent it from sticking together. As hot water evaporates off of strained pasta, the starches begin to act like glue and meld the noodles together — so a thin coating of oil is necessarily to keep them separated. 10. Always reserve a cup of pasta water before straining it. Pasta water is seasoned and filled with starch, so it’s pretty helpful when trying to thicken up a sauce. For sauces that are too thin, adding a bit of cooking liquid can help thicken them up and make them glossy. Chefs use this technique all the time when finishing pasta, and they sometimes go as far as calling it “liquid gold” — so the next time you cook pasta, reserve a cup of it just in case you need it. 11. Add your cooked pasta to your sauce, not the other way around. As soon as your pasta is cooked through, add it to your sauce that’s been heated in a hot pan. The pasta will continue cooking in the sauce and absorb the flavor, and it’ll meld with the pasta better and become evenly coated. Sure, you could just dump your sauce right over the pasta, but it’ll barely coat the noodles and pool at the bottom of your pot instead of uniformly coating it. 12. If adding cheese to your pasta, remove it from the heat to prevent it from sticking to the pan.